What types of SWAT vehicles do you offer? 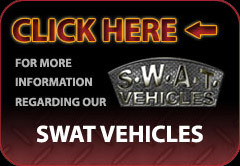 SWAT vehicles are what we're known for, and we offer a variety of SWAT special vehicles to choose from. Our inventory includes SWAT police vehicles, armored trucks, armored vans, prisoner transport vehicles, Suburbans, and more. Learn more about our line of SWAT cars and armored transport vehicles today. Take advantage of the advanced design and superior engineering our SWAT cars offer, as well as a wide range of options certain to fit your needs. Our advanced engineering and manufacturing capabilities set our SWAT vehicles apart from the rest. From prisoner transport and SWAT police vehicles to Suburbans and more, we can address your need for SWAT special vehicles and armored transport. Peruse our line of SWAT cars and find the one that's right for your specific goals and missions. Our line of SWAT vehicles is as diverse as any you can hope to find, and includes SWAT cars, SWAT police vehicles, armored vans, armored trucks, and much more. It's little wonder we're the go-to name for police tactical vehicles in the industry. Let us be your source for SWAT special vehicles.